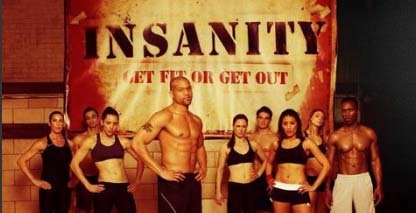 Shaun T Asks: Are You Insane Enough To Be Fit? *If you stay up late enough you will see some of the craziest exercise phenomenons ever. The Ab Roller, the Ab Crunch and, least we forget, the giggle-inducing naughtiness of every Shake Weight workout. But there are so many overweight Americans that every home fitness enterprise that is created seems to be an instant success. Our Lee Bailey thinks he found a brother who is on the verge of the next best thing. His name is Shaun T, of Hip-Hop Abs fame. Now, he’s back with “Insanity,” a workout so off the wall Uncle Lee was tired just looking at it. The workouts look so challenging that even some professional athletes might have trouble with them. But Shaun tells EURweb.com that it only appears difficult. OK, Shaun tells us that anybody can do the workouts, but we pressed him on that a little harder and he did eventually concede … just a bit. So, what type of “knowledge” does one have to have to perform “Insanity” at peak efficiency? Let us get this straight, this brother played both football and basketball in high school, ran track in high school and college then was a professional dancer? This workout is not for any normal American. But that’s exactly how he wanted it. Not for nothing, but the “Insanity” workout seems like it’s only for people that are extremely serious, or have an exercise induced death wish. Shaun T’s career takes him all across the map. We asked him what he felt the biggest difference in fitness is between the United States and other countries to which he has traveled. “It is astounding the fitness level between America and Asia. For instance, Tokyo. There are very few people there that are overweight, quote unquote. I say quote, unquote because I know that fitness level is not completely dependent upon weight. These people eat good, they have a law in Tokyo where if you’re under a certain number of centimeters your BMI (Body Mass Index) has to be under a certain number or you get taxed. Yikes! You get taxed? Don’t get us wrong. We like big butts just as much as the next urban website, but if that law was introduced here then that would make up for the federal deficit and then some. The 20th century has witnessed this country enjoy of a string of successes that are historically unprecedented. Could it be we’re wallowing in our own success? Is it the types of foods we’re eating? “It’s not really about what as much as it’s about how much,” he explained. “Like most restaurants, for example Cheesecake Factory. How big are the plates there? It comes down to what you learned in school with the food pyramid. If you just have portion control you basically can eat whatever you want. We think the more rice we have the better, the bigger the plate the better or I need to have dessert. You don’t need to have dessert. That’s where people get it wrong. One of the best pieces of advice that I like to give to people is don’t drink your calories. I promise that if you would stop drinking soda for a month you would loose ten to twenty pounds. It’s a promise. It’s caloric intake to output and it’s just sugar you don’t need. It’s those little things that would make a huge difference. One glass of wine is actually good for you. But it’s never one. It’s never one! Now wait a minute, says the naysayer, you have been at your athletic peak for most of your life! How are you going to profess to know the everyday eating habits of the everyday American? Previous ArticleVideo: Is ‘Kolored Kids’ Soap Racist or Historic? His abs are insane..OMG!I like a lot of physical exercise- boot camp twice a week, body pump twice- but I am not Insane enough to think I could even do this!H E doublehockeysticks NO!